"His house - Two Moon." As we drew near we came to a puzzling fork in the road. The left branch skirted a corner of a wire fence, the right turned into a field. We started to the left, but the waving of a blanket in the hands of a man at the cabin door directed us to the right. As we drew nearer we perceived Two Moon spreading blankets in the scant shade of his low cabin. Some young Cheyennes were grinding a sickle. A couple of children were playing about the little log stables. The barnyard and buildings were like those of a white settler on the new and arid sod. It was all barren and unlovely - the home of poverty. As we dismounted at the door Two Moon came out to meet us with hand outstretched. "How?" he said, with the heartiest, long-drawn note of welcome. He motioned us to be seated on the blankets which he had spread for us upon seeing our approach. Nothing could exceed the dignity and sincerity of his greeting. As we took seats he brought out tobacco and a pipe. He was a tall old man, of a fine, clear brown complexion, big-chested, erect, and martial of bearing. His smiling face was broadly benignant, and his manners were courteous and manly. While he cut his tobacco Wolf Voice in­terpreted my wishes to him. I said, "Two Moon, I have come to hear your story of the Custer battle, for they tell me you were a chief there. After you tell me the story, I want to take some photographs of you. I want you to signal with a blanket as the great chiefs used to do in fight." Wolf Voice made this known to him, de­livering also a message from the agents, and at every pause Two Moon uttered deep-voiced notes of comprehension. "Ai," "A-ah," "Hoh," these sounds are com­monly called "grunts," but they were low, long-drawn expulsions of breath, very ex­pressive. Then a long silence intervened. The old man mused. It required time to go from the silence of the hot valley, the shadow by his little cabin, and the wire fence of his pasture, back to the days of his youth. When he began to speak, it was with great deliberation. His face became each moment graver and his eyes more introspective. "Two Moon does not like to talk about the days of fighting; but since you are to make a book, and the agent says you are a friend to Grinnell, I will tell you about it - the truth. It is now a long time ago, and my words do not come quickly. 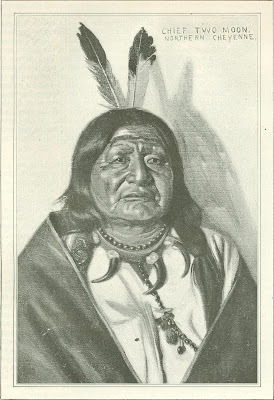 "That spring  I was camped on Powder River with fifty lodges of my people - Cheyennes. The place is near what is now Fort McKenney. One morning soldiers charged my camp. They were in command of Three Fingers [Colonel McKenzie]. We were surprised and scattered, leaving our ponies. The soldiers ran all our horses off. That night the soldiers slept, leaving the horses one side; so we crept up and stole them back again, and then we went away. 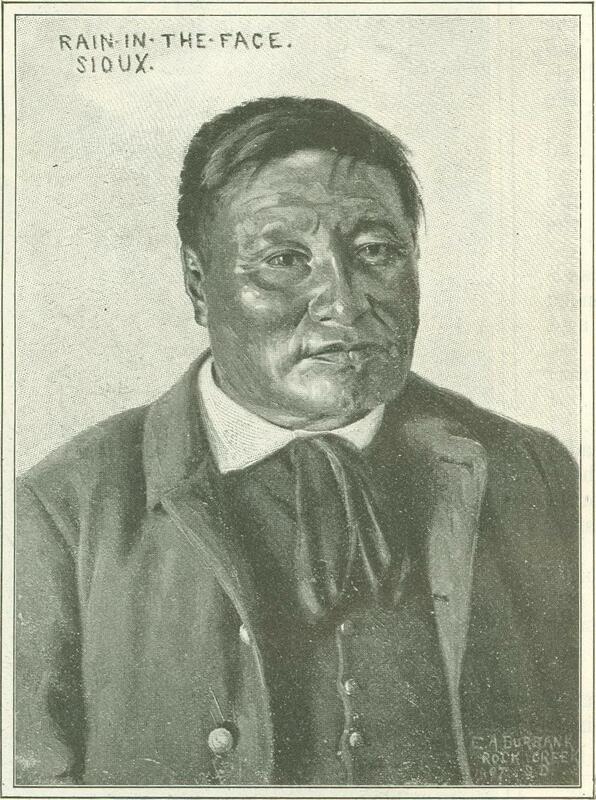 "We traveled far, and one day we met a big camp of Sioux at Charcoal Butte. We camped with the Sioux, and had a good time, plenty grass, plenty game, good water. Crazy Horse was head chief of the camp. Sitting Bull was camped a little ways below, on the Little Missouri River. "The camp was al­ready full of wounded men, women, and children. "I said to Crazy Horse, All right. I am ready to fight. I have fought already. My people have been killed, my horses stolen; I am satisfied to fight.'" Here the old man paused a moment, and his face took on a lofty and somber ex­pression. 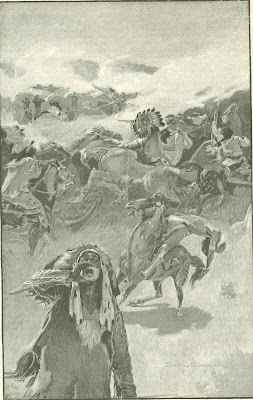 "I believed at that time the Great Spirits had made Sioux, put them there," he drew a circle to the right - " and white men and Cheyennes here," indicating two places to the left - " expecting them to fight. The Great Spirits I thought liked to see the fight; it was to them all the same like playing. So I thought then about fighting." As he said this, he made me feel for one moment the power of a sardonic god whose drama was the wars of men. "About May, when the grass was tall and the horses strong, we broke camp and started across the country to the mouth of the Tongue River. Then Sitting Bull and Crazy Horse and all went up the Rosebud. There we had a big fight with General Crook, and whipped him. Many soldiers were killed - few Indians. It was a great fight, much smoke and dust. "I rode swiftly toward Sitting Bull's camp. There I saw the white soldiers fight­ing in a line [Reno's men]. Indians cov­ered the flat. They began to drive the sol­diers all mixed up - Sioux, then soldiers, then more Sioux, and all shooting. The air was full of smoke and dust. I saw the soldiers fall back and drop into the river-bed like buffalo flee­ing. They had no time to look for a crossing. The Sioux chased them up the hill, where they met more sol­diers in wag­ons, and then messengers came saying more soldiers were going to kill the wo­men, and the Sioux turned back. Chief Gall was there fighting, Crazy Horse also. "I then rode toward my camp, and stopped squaws from carrying off lodges. While I was sitting on my horse I saw flags come up over the hill to the east like that [he raised his finger-tips]. Then the soldiers rose all at once, all on horses, like this [he put his fin­gers behind each other to indicate that Cus­ter appeared marching in columns of fours]. They formed into three bunches [squadrons] with a little ways between. Then a bugle sounded, and they all got off horses, and some soldiers led the horses back over the hill. "Then the Sioux rode up the ridge on all sides, riding very fast. The Cheyennes went up the left way. Then the shooting was quick, quick. Pop – pop - pop very fast. Some of the soldiers were down on their knees, some standing. Officers all in front. The smoke was like a great cloud, and every­where the Sioux went the dust rose like smoke. We circled all round him - swirling like water round a stone. We shoot, we ride fast, we shoot again. Soldiers drop, and horses fall on them. Soldiers in line drop, but one man rides up and down the line - all the time shouting. He rode a sorrel horse with white face and white fore-legs. I don't know who he was. He was a brave man. "Indians keep swirling round and round, and the soldiers killed only a few. Many soldiers fell. At last all horses killed but five. Once in a while some man would break out and run toward the river, but he would fall. At last about a hundred men and five horsemen stood on the hill all bunched to­gether. All along the bugler kept blowing his commands. He was very brave too. Then a chief was killed. 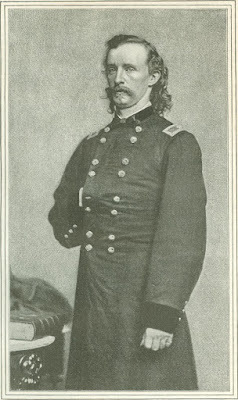 I hear it was Long Hair [Custer]. I don't know; and then the five horse­men and the bunch of men, maybe so forty, started toward the river. The man on the sorrel horse led them, shouting all the time. 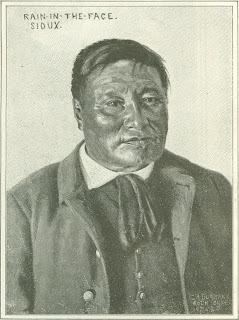 He wore a buckskin shirt, and had long black hair and mustache. He fought hard with a big knife. His men were all covered with white dust. I couldn't tell whether they were officers or not. One man all alone ran far down toward the river, then round up over the hill. I thought he was going to escape, but a Sioux fired and hit him in the head. He was the last man. He wore braid on his arms [sergeant]. "All the soldiers were now killed, and the bodies were stripped. After that no one could tell which were officers. The bodies were left where they fell. We had no dance that night. We were sorrowful. 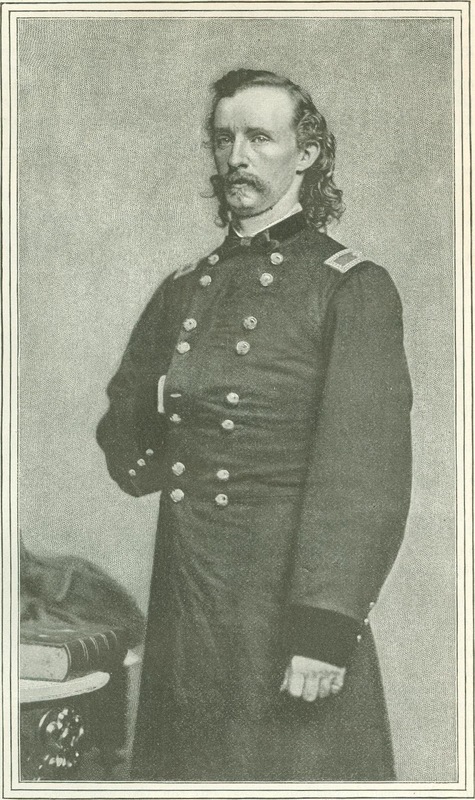 "Next day four Sioux chiefs and two Cheyennes and I, Two Moon, went upon the battlefield to count the dead. One man car­ried a little bundle of sticks. When we came to dead men, we took a little stick and gave it to another man, so we counted the dead. There were 388. There were thirty-nine Sioux and seven Cheyennes killed, and about a hundred wounded. "Some white soldiers were cut with knives, to make sure they were dead; and the war women had mangled some. Most of them were left just where they fell. We came to the man with big mustache; he lay down the hills towards the river. The Indians did not take his buckskin shirt. The Sioux said, 'That is a big chief. That is Long Hair.' I don't know. I had never seen him. The man on the white-faced horse was the brav­est man. "That day as the sun was getting low our young men came up the Little Horn riding hard. Many white soldiers were coming in a big boat, and when we looked we could see the smoke rising. I called my people together, and we hurried up the Little Horn, into Rotten Grass Valley. We camped there three days, and then rode swiftly back over our old trail to the east. 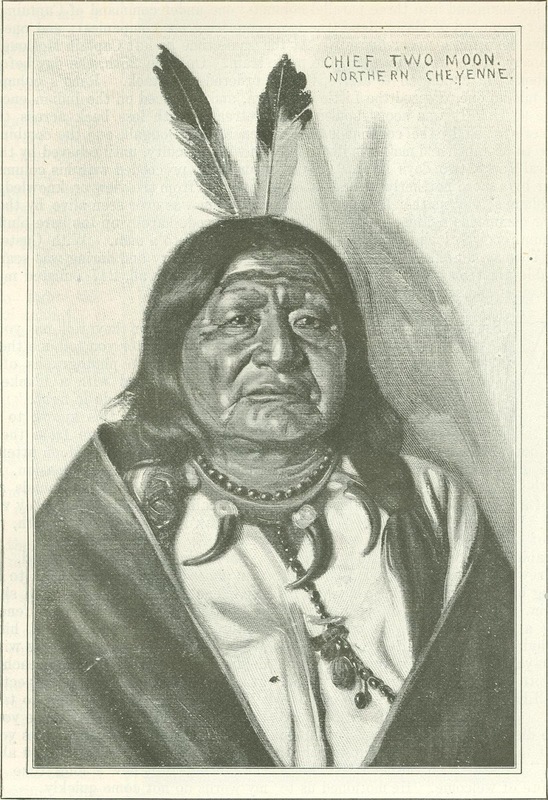 Sitting Bull went back into the Rosebud and down the Yellow­stone, and away to the north. I did not see him again." The old man paused and filled his pipe. His story was done. His mind came back to his poor people on the barren land where the rain seldom falls. "That was a long time ago. I am now old, and my mind has changed. I would rather see my people living in houses and singing and dancing. You have talked with me about fighting, and I have told you of the time long ago. All that is past I think of these things now: First, that our reservation shall be fenced and the white settlers kept out and our young men kept in. Then there will be no trouble. Second, I want to see my people raising cattle and making butter. Last want to see my people going to school to learn the white man's way. That is all." There was something placid and powerful in the lines of the chief's broad brow, and his gestures were dramatic and noble in sweep. His extended arm, his musing eyes, his deep voice combined to express a meditative solemnity profoundly impressive. There was no anger in his voice, and no reminis­cent ferocity. All that was strong and fine and distinctive in the Cheyenne character came out in the old man's talk. He seemed the leader and the thoughtful man he really is - patient under injustice, courteous even to his enemies. Originally published in McClure’s Magazine in September of 1898.